Celebrate Mardi Gras at Harley-Davidson® of Dallas! 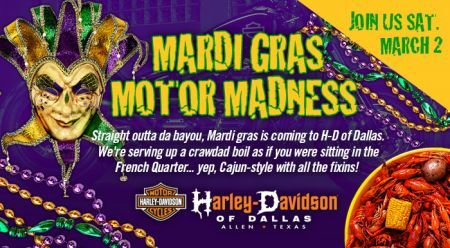 Straight outta da bayou, Mardi gras is coming to H-D® of Dallas. We're serving up a crawdad boil as if you were sitting in the French Quarter... yep, Cajun-style with all the fixins. Join us Saturday, March 2 2019 in Allen Texas for this Harley-Davidson® event! We'll also have breakfast in the morning, New Orleans jazz music, prize giveaways and much more. Mark your calendar; you don't want to miss this!